I’m a sucker for history especially those that concern World Wars (NOT because I love wars), Ancient Greece and Ancient Rome — so you could imagine how incredibly excited I was when I finally had the chance to visit Rome in Italy early this year! FACT: When I was a child, I fell in love with the Romans’ controversial gladiator battles, as well as their grand engineering feats. Naturally, the Colosseum was high up on my must-see list, and when I finally saw it before me… I was blown away. With that and the rest of the city’s breathtaking landmarks, ruins, piazzas, and fountains (among many others), you bet that Rome quickly became one of the top cities that I love. It is just soooo rich with beauty and history, that it can quickly enrapture any kind of traveler out there! I only spent 3 nights there and it did feel short; despite that, I had a magical time. In fact, the icing to the cake for my whole trip was when Through Eternity Tours took me on an exclusive 2-day private tour all over the city! For sure I could have toured the city by myself, but with an ancient city like Rome…? I knew that I needed an experienced guide that will help refresh my memory on all of the legendary events that took place there in the past. I needed details, guidance, and a swell time — and I sure got it! Through Eternity has been in operation for over 17 years now. It’s quite apparent that over the years, they have gained the full satisfaction and trust of each of their customers! With their experienced guides, they currently provide tours all over the following Italian locations. This is one of the most immersive tours offered by Through Eternity! Not only do you get to solo out a qualified guide and ask all the questions and recommendations that you would want to know as you explore the top highlights of Rome, but you also get to skip the long lines that plague the attractions such as that of the Vatican Museums and the Colosseum — yep, it’s a true-blue VIP treat! I swear, I was extremely thankful that I picked Through Eternity because if not for them, I could have suffered long agonizing hours waiting in those lines — which would have been such a waste especially since I only had a limited amount of time to spend in the city. Explore piazzas and famous fountains like Trevi Fountain, Spanish Steps, Piazza Sant’Eustachio, Piazza Navona, Piazza Farnese, and Campo de’ Fiori. Drop by Venchi for gelato or chocolates and witness their massive ‘chocolate waterfall’ — yep, you read that right! See the stunning Pantheon and Hadrian’s Temple. Witness the imposing fortress of Castel Sant’Angelo (it has great panoramic views on top overlooking the Rome cityscape, especially that of the river and the Vatican). Continue onward to St. Peter’s Basilica and St. Peter’s Square. If there’s still free time, explore the cobbled pathways and charming trattorias in the lively neighbourhood of Trastevere. Wear comfortable shoes since this is primarily a walking tour and there are areas in Rome with steps and uneven walkways. When visiting the Vatican, there is a dress code wherein you’re required to keep your shoulders and knees covered. Large bags, backpacks, tripods and large umbrellas are not allowed inside the museums but these can be left at the museum coat check (which you can retrieve after visiting the basilica). Be prepared in case the Basilica of St. Peter’s gets closed due to unscheduled closing and late openings due to religious ceremonies. These are often last-minute so you must be prepared for the chance that you won’t get to visit inside. What’s not included? Food, drinks, and transportation fees. Rest assured, everything can be done by foot. Obviously, it’s a luxurious affair but it’s definitely a fair price given all of the things that you will be doing and the perks that you’ll be receiving. I absolutely find it as a worthy price to pay if you’re seeking for an exclusive experience like I did! My guide for my 2-day VIP experience in Rome was an amazing woman whose name was Gracelyn. She was a joy to be with, and as a fellow history buff, she gave me tons and tons of fun trivia and facts that I wouldn’t have learned if I did not go with Through Eternity — so thank goodness, I did! In fact, I think it’s mostly because of this tour that I have swiftly fallen in love with Rome. After all, every single thing that I laid my eyes on had gained new and deeper meanings, and with the ‘local knowledge’ and companionship that Gracelyn offered, I felt that I truly blended in with the Italian community all throughout my stay. That being said, with the level of service that she had given me, I am sure that the rest of Through Eternity’s guides will have the same ‘magic touch’! Remember, they have stayed successful for over 17 years already and that means something. As the famed city, I had high hopes for Rome when I first stepped foot in its soil. And well, I can assure you that those expectations were met — and even more! There was just so much to do, see, and love about this city given its immensely rich historical heritage and urban scene. …Sure, I had a great and fulfilling tour that made me see the top highlights, but I still want to come back and spend a longer time soaking it all in. So yes, I will definitely come back (and probably try a different Through Eternity kind of tour)! Where to get the best flight deals to Rome? There are 2 main airports in Rome: Leonardo da Vinci/Fiumicino International Airport and G.B. Pastine/Ciampino International Airport, with the former being the city’s main airport and the latter being the low-cost airline airport (ex: airlines of Easyjet, Ryanair, Wizzair, etc.). How to get to the Rome city center from the airport? From Fiumicino: by public taxi (flat price of €48 to city ring), by train (to Roma Termini central train station €14 via Leonardo Express), and by bus (cheapest option: take COTRAL bus to “EUR Magliana” stop at line B [Fiumicino-Porto-Magliana sign] and then take the Metro, cost of = €2.50 bus + €1.50 Metro). From Ciampino: by public taxi (flat rate of €30) and by direct bus (arrives at Termini station in downtown Rome with cost starting at €4). How about going around Rome? By private car. Not advisable as the traffic can get chaotic. By taxi. Take note that these taxis are white, and for them to be legit, they must have a taximeter and a taxi light. Now, they’re quite expensive but if you’re on a rush, cost starts at €3 and can go up to €27 in an hour. Flagging them down is possible but they prefer to take passengers via the taxi stands or by calling them up for booking. By foot. Everything at the center can be explored by foot. By public transportation. All of Rome’s public transportation network use the same kind of tickets so you can buy passes like Roma 24H (€7), Roma 48H (€12.50), and Roma 72H (€18). You can buy these tickets from ‘tobacconist’ shops (with the big ‘T’ sign), news stands, automated ticket kiosks and ticket windows. Single ride ticket costs €1.50 (valid for 100 minutes, meaning that you can change buses, trams and go in and out of the Metro in one journey within that timeframe). If you want discover and learn MORE about Rome in a way that will make the most of your staycation, Through Eternity Tours is definitely the way to go! They have made mine as extraordinary as it can be, and I bet that they will do the same for you. Besides, with the wide range of unique tour packages that they have, there are various memorable adventures that will fit your fancy and that will make you bring home tons of stories to tell! What do you think of Through Eternity Tours? Would you like to try out their tours? Why or why not? Have you been to Rome before? How was your experience? Awesome to hear! Thanks Nikki! Have fun in Rome — I LOVE that city! Rome is one of my all time favorite spots. Love your itinerary for a visit there! I love Rome!! I've been there three times and every time I go I find something new to see! Religious or non Religious traveler would appreciate Rome by its beauty and uniqueness. 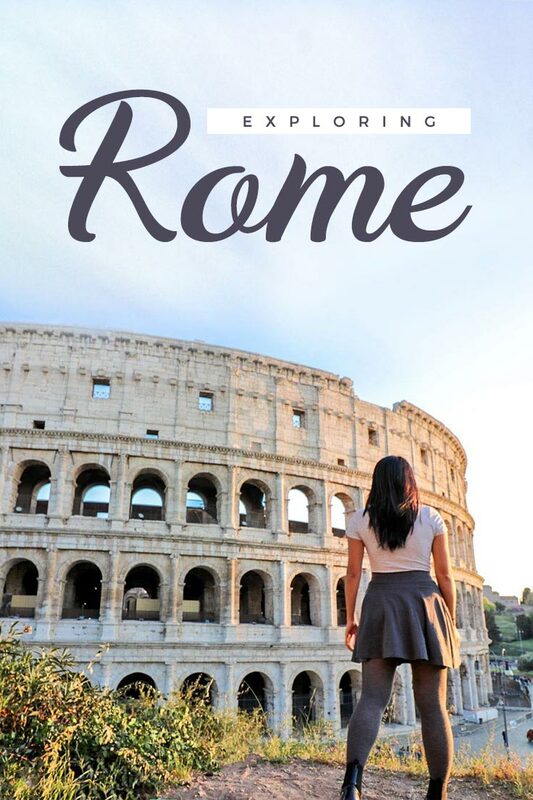 Rome is in my bucket list your tips and guide really helps my decision to make plans very soon. How can you not enjoy this trip. Indeed one of a kind adventure that everyone must experience.